Fayetteville is awesome, especially this time of year. I loved NW Arkansas when I made the trip. All four towns up there are great areas with nice little downtowns. Make sure to stop in Eureaka Springs, should be really nice this time of year. - Hugo's is just off of Dickson, towards the square. Good burgers and sammiches!! - Wasabi: sushi place, pretty good food. There are others, I'm just not that familiar. As to bars, there are lots of them up and down the street. The rest just stop by and see what you like!! Seafood: go to Louisiana for seafood. If not then you can try the Catfish Hole. Big meeting place for the pigs...they bring recruits there. Pretty good food. Thai: lots of places all around NWA, Taste of Thai on the square is pretty good. Italian: Joe's Italian, Geraldi's or go to Tontitown to Mama Z's or Venesian Inn. Eureka Springs is a neat side trip but I've got no rec's for there. It's small enough you can easily check out what you want. Dress warm, it's gonna be real cold. I'm gonna be in indoor Club rocking the Tigers!!! Fayetteville and Starkville. The 2 places you request a room without a view. Serious question. 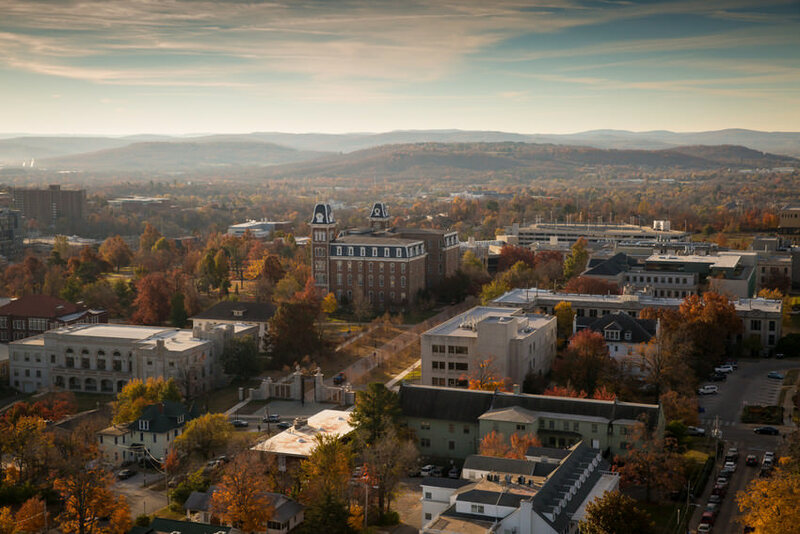 Have you ever actually been to the Fayetteville? Because saying there are no views in Fayetteville or the surrounding area leads me to believe you haven’t. It’s a beautiful place in general. Just my opinion obviously. Not really. I call it the WalMart airport. Flew there on Thanksgiving Day and they were announcing that they were closing within a few minutes. Wright’s BBQ in Fayetteville is the best BBQ in the state. 50% of UA students are from Texas and a lot of them I’ve talked to say it’s as good as anything they’ve had. There is a ton to do outdoors but probably too cold for that right now. The promenade area in Rogers has great shopping and entertainment (Dave & Busters, Bass Pro, Topgolf coming soon). Downtown Bentonville has a lot of good restaurants and Crystal Bridges is a big attraction...the Walmart museum is also there and has an old fashioned ice cream shop inside. Just depends what you want to do. Fayetteville is obviously more of a younger scene but Rogers and Bentonville have a lot of things to do for families and young professionals. Devil's Den, about 30 minutes south. You can tell which people have and haven't been to Fayetteville. This. Especially this time of the year when the leaves are changing colors. Fayetteville is much nicer than Louisiana.